The ideal candidate should be a high level of energetic, self motivated positive minded personality with sound knowledge in HR Management who is willing to take responsibilities and take initiatives to handle assigned task within specific time limits. He should be disciplined and Proactive personality. Should possess 5 Credit passes for GCE O/L including Mathematics & English & GCE A/L with 03 Passes. Part or Full qualification in HRM from a recognized Institution. Professional membership in HR is an added advantage. 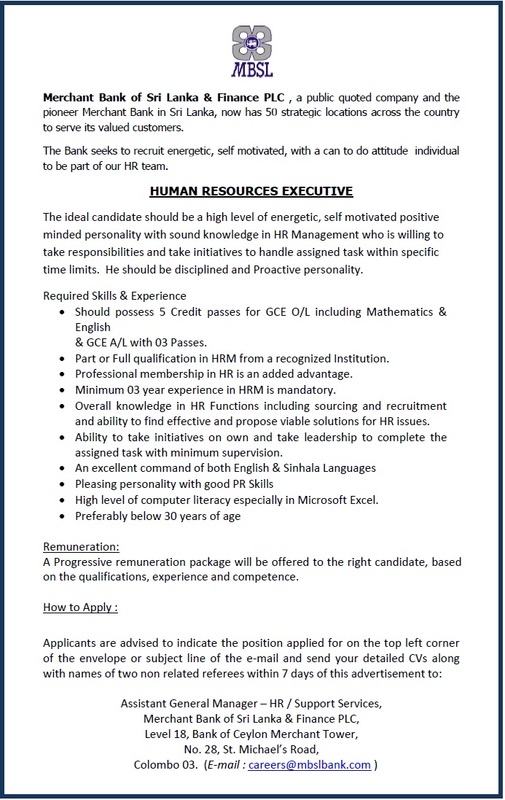 Minimum 03 year experience in HRM is mandatory. Overall knowledge in HR Functions including sourcing and recruitment and ability to find effective and propose viable solutions for HR issues. Ability to take initiatives on own and take leadership to complete the assigned task with minimum supervision. An excellent command of both English & Sinhala Languages. High level of computer literacy especially in Microsoft Excel. A Progressive remuneration package will be offered to the right candidate, based on the qualifications, experience and competence. Providing Latest Vacancies in Sri Lanka. We mainly focused on Government Jobs and Banking Vacancies. Join with us on FaceBook, Twitter and Google Plus to get latest vacancies. In addition Dialog users can get subscribe to our Premium SMS Alert service. I'm Nirojah Jeyakumar from Jaffna. I'm the final year special in HRM(B.Sc) student of Trincomalee Campus Eastern University. I'm searching an internship vacancy to complete my degree program. If there any internship vacancies available please kindly recruit as intern. Thank you so much.